Think critically about safety hazards in your workplace and solve problems before they become safety incidents. Our Advanced Safety Certificate program is a nationally recognized safety curriculum based on proven best practices. 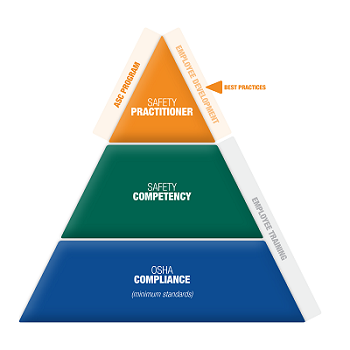 The Advanced Safety Certificate program helps safety professionals drive fundamental safety change within their organization. The ASCTM award can be earned with 12 days of coursework. The NSC Advanced Safety Certificate Program (ASC™) is a nationally recognized safety curriculum based on proven best practices. More than just safety training, ASC is a robust curriculum that is focused on developing your ability to solve problems relating to occupational safety in the workplace. Participants will develop the skills necessary to think critically about safety, create comprehensive safety plans and execute on those plans. ASC courses are designed to increase your critical thinking skill set in safety so you can contribute towards making your workplace safer. For individuals on a career path in safety, ASC provides a starting point, a clear roadmap and best-in-class educational experience to meet many industry-leading safety certification requirements. The NSC Advanced Safety Certificate Program focuses on building critical thinking skills in an Instructor-led format that fosters engaging dialogue with peers from various industries who bring their unique experiences to the classroom. This real-world approach ensures participants return to their organizations with the confidence to develop and execute safety plans and the leadership skills to drive fundamental change. What's more, the networking relationships last far beyond this course of study.